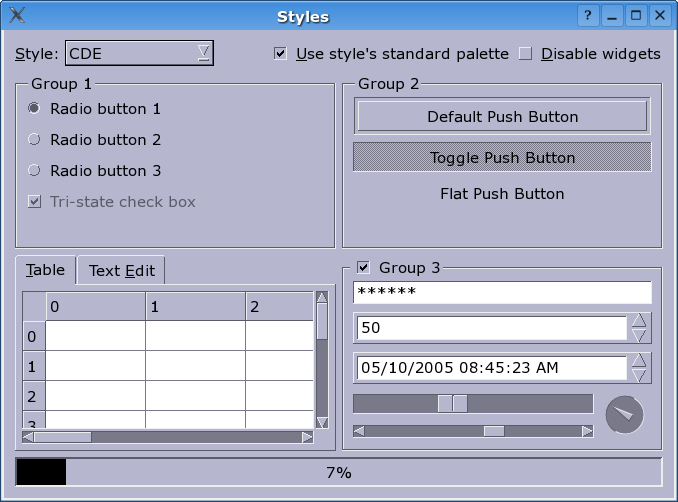 The QCDEStyle class provides a CDE look and feel. This style provides a slightly improved Motif look similar to some versions of the Common Desktop Environment (CDE). The main differences are thinner frames and more modern radio buttons and checkboxes. Together with a dark background and a bright text/foreground color, the style looks quite attractive (at least for Motif fans). Note that most of the functions provided by QCDEStyle are reimplementations of QStyle functions; see QStyle for their documentation. QCDEStyle provides overloads for drawControl() and drawPrimitive() which are documented here. See also QWindowsXPStyle, QMacStyle, QWindowsStyle, QPlastiqueStyle, and QMotifStyle. If useHighlightCols is false (the default), then the style will polish the application's color palette to emulate the Motif way of highlighting, which is a simple inversion between the base and the text color.